Winston is a member of the worlds largest Tree Frog family, they can reach over 12 to 13cm in length. They are confined in Australia to Cape York Peninsula and the wet tropics of north-east Queensland, the Gulf of Carpenteria and to the whole of New Guinea and parts of eastern Indonesia. Frogs are very important to us as the are fabulous indicators of the health of our environment - especially of water quality and the levels of pesticides and other toxins present in our ecosystem. 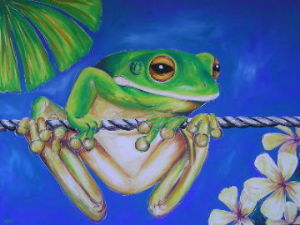 There are more than 4,000 species of frogs worldwide, occurring on every continent except Antarctica. About 200 are found in Australia. Frogs are definitely some of my favourite people, thank you for giving me the opportunity to paint Winston, he is beautiful. If you'd like to buy this painting, or one like it (a commission), or have questions about price, method of payment, packing and shipping, please email Sal.